Have other questions? Please read our complete user guide, email us at support@ryver.com, chat with us on our support site (support.ryver.com), or choose “Send Feedback” from Ryver (in the drop-down menu at the top of the left navigation bar). People – Where you talk one-on-one with other users. Teams – Where you talk privately with specific groups of people. Forums – Where you talk with all Members in your organization, plus any invited Guests. Chat – Talk one-on-one with other users. Topics – Talk privately with specific groups of people. Tasks – Manage your tasks and assign tasks to any Member or Guest. Calls – Start a voice or video conference call with any Member or Guest one click (with screen sharing). Click on the plus (+) icon next to the People channel. An email will be sent to the people you invited containing the information they need to join your Ryver account. For more information about managing Members and Guests, please review the People section of our User Guide. By job function or department (a team for “Sales”, “Customer Service”, “Marketing,” etc.). Click on the plus (+) icon next to the Teams channel. Once the Create Team window displays, give the team a name (which you can edit later) and description. When the Member or Guest logs into Ryver, they will automatically be part of the newly created team. For more information about managing Members and Guests, please review the Teams section of our User Guide. Click on the name of the team to which you want to associate the task. Click the plus (+) icon on the horizontal menu. Select the Create Task option from the menu. Once the Create Task window displays, enter the name the task into the SUBJECT field. From this window, you can also enter a description for the task, categorize the task, and add a due date and reminders for the task. You can also add tags, create checklists, and add files to the task. Click on the ellipses next to the chat or topic message that requires that someone take action (i.e., a new task), then choose Create Task from the pop-up menu. A small window displays that enables you to choose which message(s) you want to apply to the new task. Choose the message(s) to save to the task. The Add Task window displays with the message(s) added in the TRANSCRIPT field. Enter the name the task into the SUBJECT field. 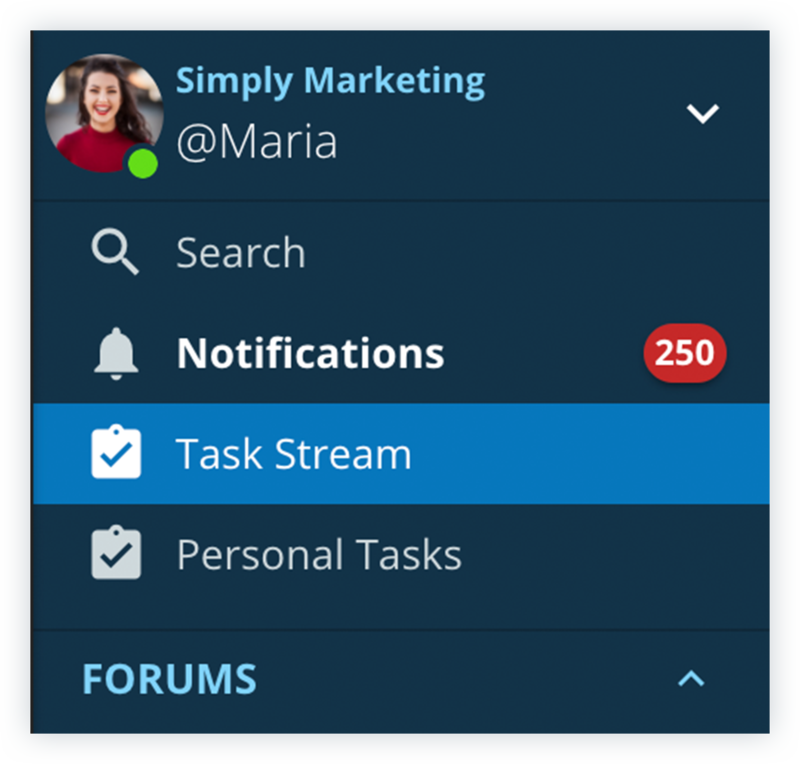 Every user can view a list of tasks to which they’re assigned by clicking on the Task Stream option in the main navigation. For more information about managing tasks, please review the Task Manager section of our User Guide.